To issue securities, including debentures, whether in or outside India. (In case of shares issue of security means issue of Letter of Offer). To invest the funds of the Company. To approve financial statement and the Board’s report. To appoint or remove key managerial personnel (KMP). To make calls on shareholders in respect of money unpaid on their shares. To authorize buy-back of securities under section 68. To approve Amalgamation, Merger or Reconstruction. Take over a company or Acquire a controlling or substantial stake in another company. For a company registered under Section- 8 to convert itself into a company of any other kind or alteration of its Memorandum or Articles. Change of location of registered office in the same State outside the local limits of the city, town or village where it is situated. Change of registered office from the jurisdiction of one Registrar to that of another Registrar in the same State. Amendment of Articles of a private company for entrenchment of any provisions. (To be agreed to by all members in a private company). Amendment of Articles of a public company for entrenchment of any Provisions. Change in name of the company to be approved by special resolution. A company, which has raised money from public through Prospectus and still has any unutilized amount out of the money so raised, shall not Change its objects for which it raised the money through prospectus unless a special resolution is passed by the company. A company shall not, at any time, vary the terms of a contract referred to in the prospectus or objects for which the prospectus was issued, except subject to the approval of, or except subject to an authority given by the company in general meeting by way of special resolution. 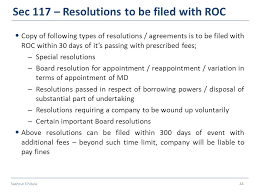 A company may, after passing a special resolution in its general meeting, issue depository receipts in any foreign country in such manner, and subject to such conditions, as may be prescribed. (Section still not applicable). Where a share capital of the company is divided into different classes of shares, the rights attached to the shares of any class may be varied with the consent in writing of the holders of not less than three-fourths of the issued shares of that class or by means of a special resolution passed at a separate meeting of the holders of the issued shares of that class. Private offer of securities requires approval of company by special resolution. 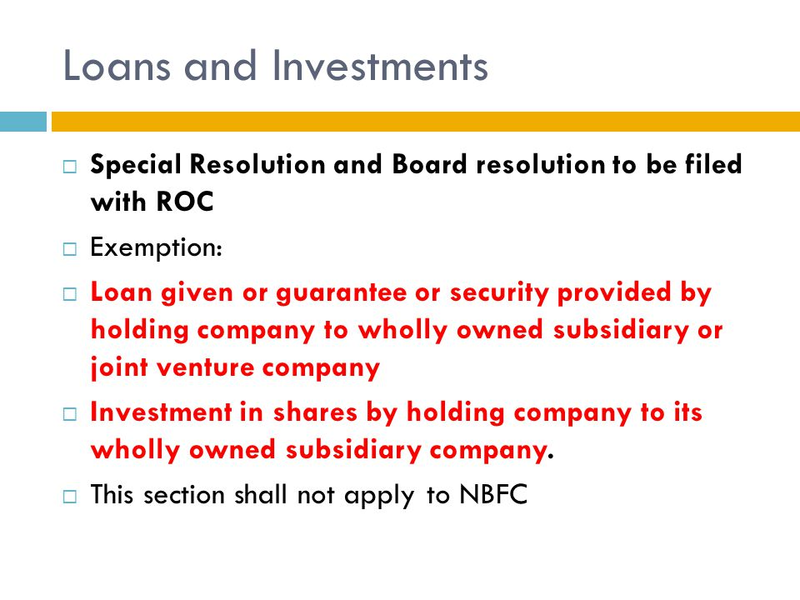 Special resolution for approving scheme for the purchase of fully-paid shares for the benefit of employees. Provided that the issue of debentures with an option to convert such debentures into shares, wholly or partly, shall be approved by a special resolution passed at a general meeting. Subject to the provisions of sub-section (1), the members of a company may, by special resolution, specify any lesser number of companies in which a director of the company may act as directors. To invest otherwise in trust securities the amount of compensation received by it as a result of any merger or amalgamation. to borrow money, where the money to be borrowed, together with the money already borrowed by the company will exceed aggregate of its paid-up share capital and free reserves, apart from temporary loans obtained from the company’s bankers in the Ordinary Course of Business. To remit, or give time for the repayment of, any debt due from a director. Loan& Investment by company exceeding 60% of paid up share capital or 100% of free reserve. Special Resolution for winding up of the company by Tribunal. Special Resolution for winding up of company. Conversion of private company into One Person Company. The company in general meeting shall pass an ordinary resolution for change of name on receipt of direction from the Central. 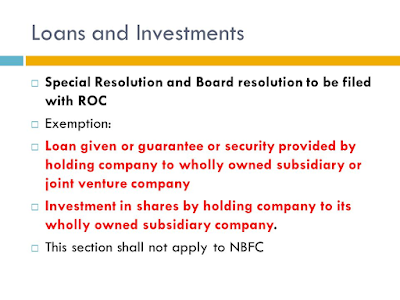 A company, if authorized by its Articles, by ordinary resolution, can increase or consolidate its capital or sub-divide or cancel shares not taken up. Approval of general meeting for inviting deposits from members. For consideration of accounts and directors report and report of auditors, declaration of dividend, appointment of director on place of who resign. Appointment of a Director by small shareholders. Appointment of Directors at the first general Meeting. Appointment of Director on being proposed by a member or other person with a deposit of rupees one lakh.